With all the shows available these days for kids, it’s hard to pick the best possible ones for your family. As parents, we of course want to make sure that what our children are seeing and hearing on TV is not only safe and appropriate, but enriching and educational as well. I’m happy to share that I found a show that checks all of my requirements off the list, and Sophie is obsessed (so that helps of course!). 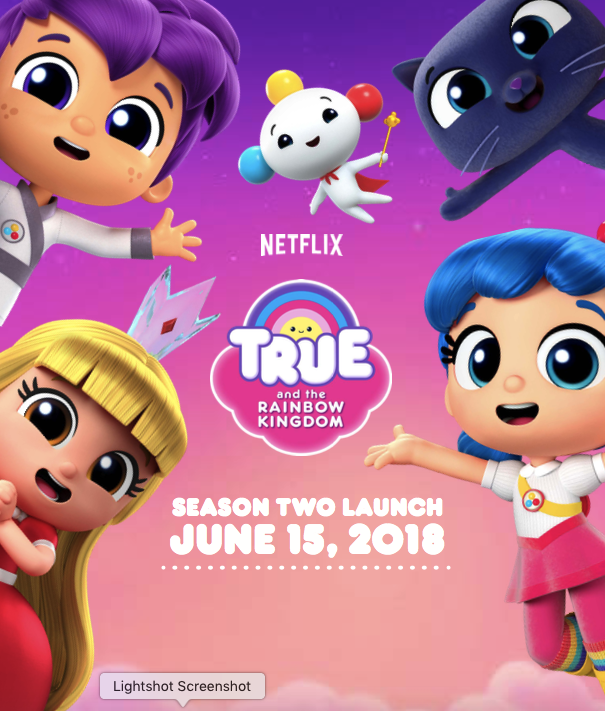 True and the Rainbow Kingdom is a children’s show on Netflix for young girls ages 3-6. The show’s main character, True, is a fearless eight year-old who helps the whimsical citizens of the Rainbow Kingdom alongside her best friend, Bartleby the Cat. When something goes awry in the Kingdom, True is the only one with the ability to wake the powers of the Magical Wishes of the Wishing Tree. True works to solve the problems in the Rainbow Kingdom, so she can keep the citizens safe and empower those around her with imagination, empathy, and mindfulness. Season 2 is out now on Netflix, so check it out! The show is produced by Pharrell Williams among others. Latest trailer can be viewed here.